Now this is much delayed because it's taken me an age to find the motivation, truth be told I'm exhausted with dealing with car issues from previous experience and just want this to be as painless as possible. So some may remember that I was one of those who has suffered the dreadful wear on our P-Zero's on the Facelift RS3, such wear was causing the inner ply of the tyres to be exposed on the inside edge. 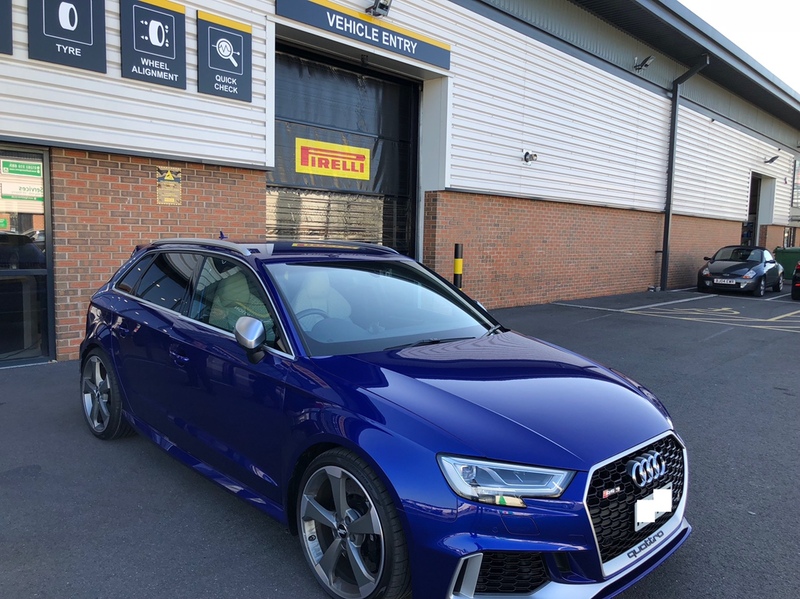 My car had wheel alignment 3 times in an 11,000 mile period yet still had this issue, never out of specification and when Pirelli checked my car at 11,000 miles they were genuinely shocked to see how well set up it was. All was green, a slacken of one of the track rod end lock nuts was enough to perfect my alignment. It all started when I went in for a service and Audi found the wear, it is scary because I wouldn't have noticed it knowing in my mind I had a good 3.5mm+ of tread not triggering me to check the inside edges. 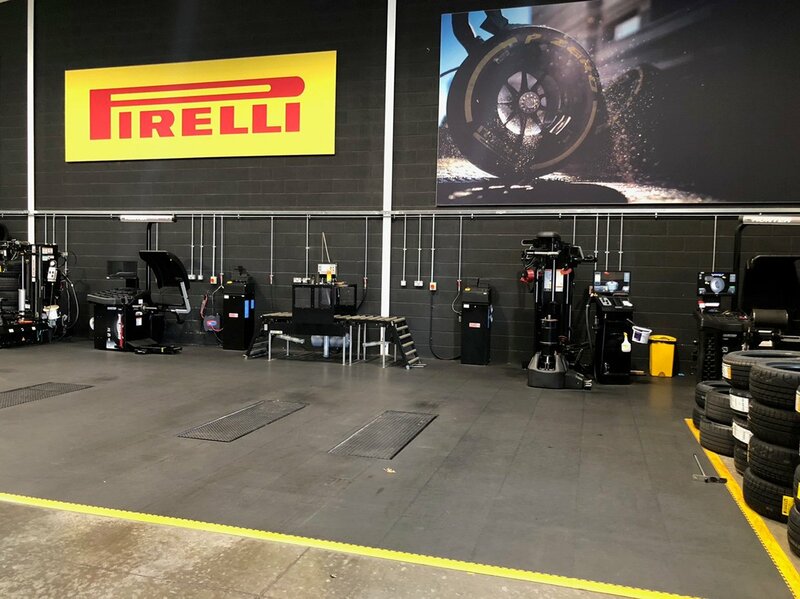 I contacted Pirelli who were superb from start to finish, they put me in touch with one of their Field Engineers who came to the house to carry out as much of an inspection as is possible on a sobbing wet day with the car on the ground. 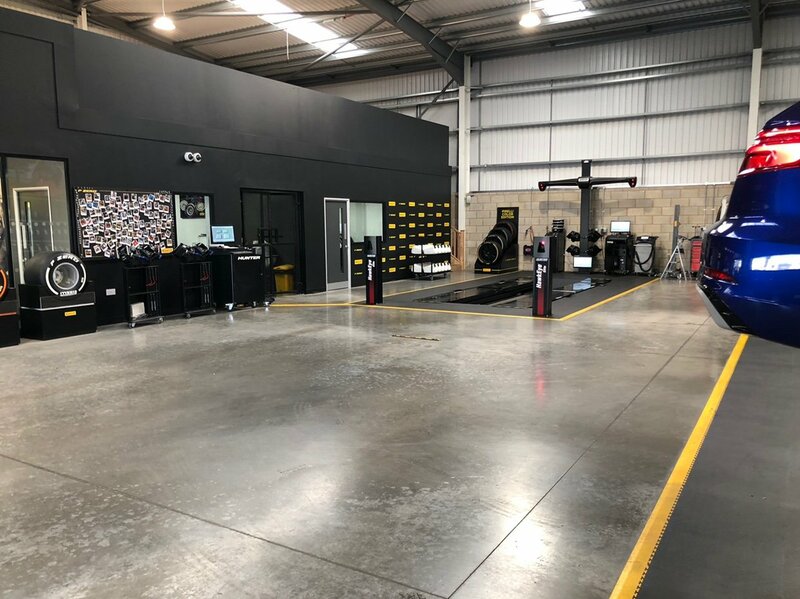 Their engineer took my tyres back to their factory and testing facility in Burton-upon-Trent where the tyres were "cut, sectioned and shaved" for analysis. 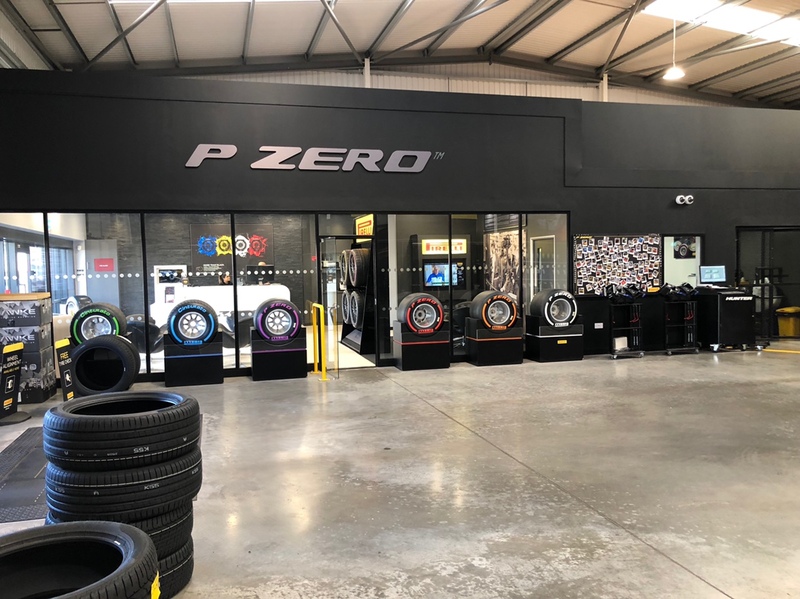 No defect was found with either tyre, I was assured beforehand if there was an issue it would be address / adequately compensated because of the pride in their brand and the kind of cars they are proud to work on. 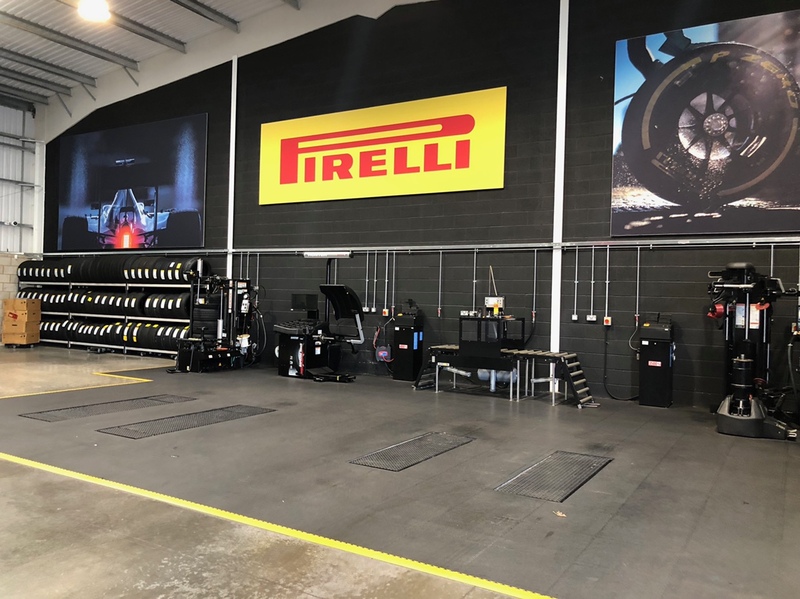 From this it was agreed I would pay a visit to the 'UK Leading' tyre centre, which is the purpose built Pirelli Performance Centre in Burton-upon-Trent outside the factory. A tank of fuel later I made the trip up and back, the same field engineer also made the 5+ hour round trip to be there with me on the day. They fitted two new rear tyres as these had limited tread remaining and they preferred to do a setup on 4 new tyres. They rebalanced all 4 wheels on their road force balancing machine so the car as far as wheels and tyres were concerned was spot on when I left. 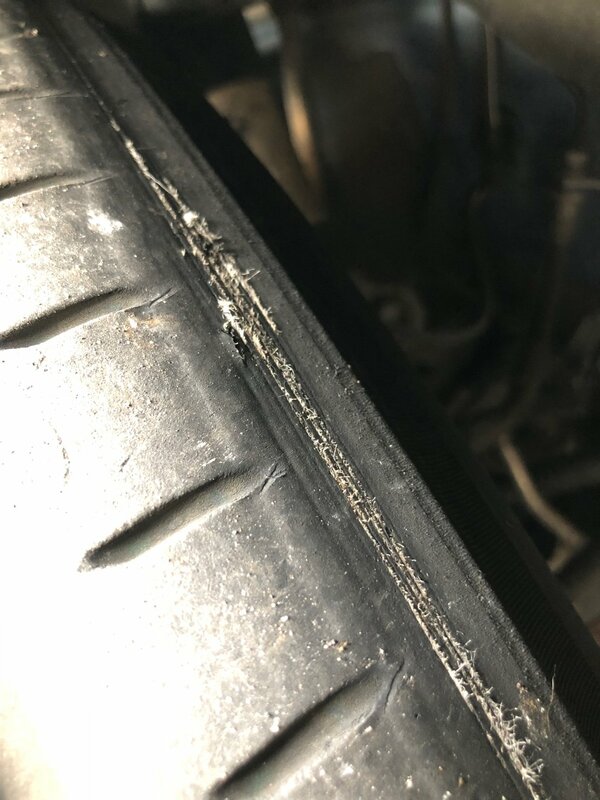 They inspected the footprint of the tyre on the road and found how the car seems to lean heavily onto the inside and outside walls when on full lock on some gradients, which they believe could be causing the wear as when the inside edge is the only 1/3 of your tyre on the tarmac, it doesn't take a genius to work out this is an issue. 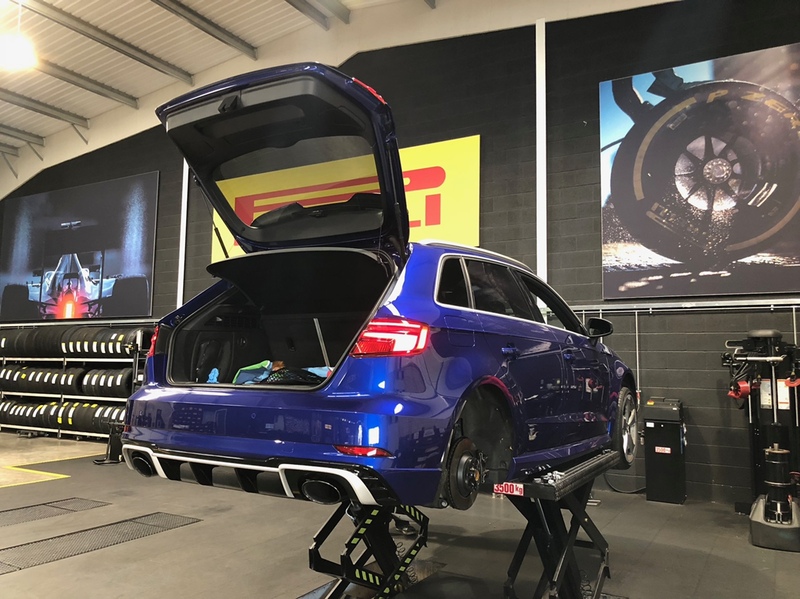 I've gone back to Audi who have said they can't do any more than what has been done, new tyres, rebalanced and alignment is 100% perfect and if the wear persists as Pirelli have said "is a characteristic of the chassis". I have pushed however and am trying to get the technical department of my local Audi Centre to lend a helping hand to get me in touch with the big guns. I've been assured that Audi have their own field engineers and although they don't like to send them out they are available to inspect the car and progress from there. 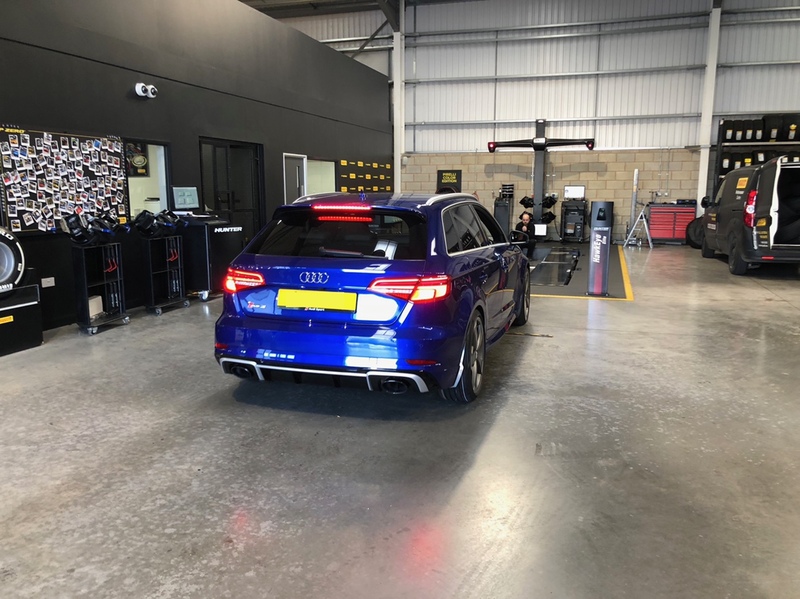 I will try when time allows but Customer Service will be a total waste of time as they usually are and won't be able to help with this issue other than to get the car into Audi for an inspection and alignment, which has been done. I fear this is a characteristic of the car and a major design flaw, hence would require a major repair to rectify the issue. If it is a characteristic, it isn't one that Audi had actively worked to design into the car now is it? It is an issue and an unforeseen problem in the development. If Pirelli get enough people complaining, it will be raised at their Head Office in Italy and then they Dan make the awkward decision whether to contact Audi themselves and raise the issue, but for this it will take numbers! Can you imagine how awkward it would be for the tyre supplier to contact the manufacturer and tell them “we think you’ve made an issue in the design of your car”, it may rock the boat. Truth be told, I really can't see us getting anywhere as owners and can see this as another opportunity for Audi to let us down again, but all I can ask of you all is to contact Pirelli and Audi yourselves when and if you experience this issue. 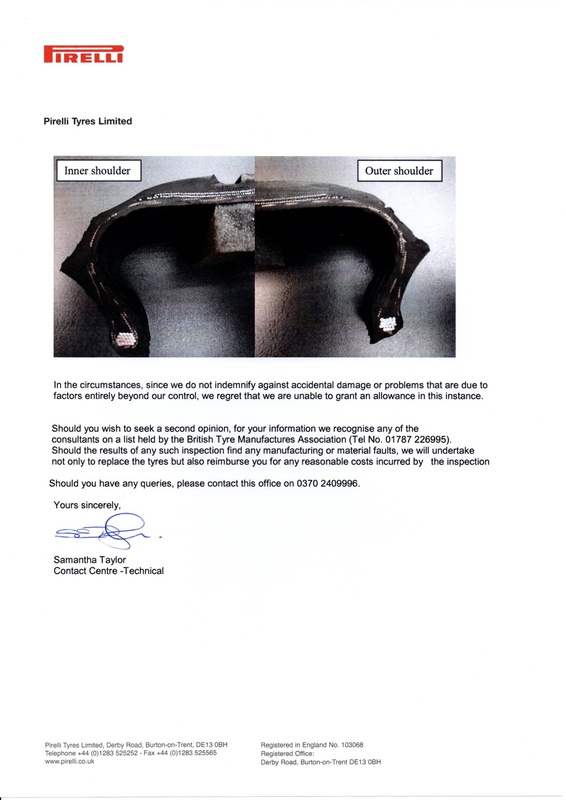 Please contact Pirelli who will follow the same process as they did with me, inspection and report. Numbers is going to be the key part to play in this, if enough of us come forwards and enough Audi Centre's come forward to Audi Technical I can only hope that this will be looked into. My next port of call (really don't know if it will work) is to contact the Driver Vehicle Standard Agency 'DVSA' who have the power to force a recall on a manufacturer if a safety issue is found, in my eyes this is a safety issue because of the condition we are all finding ourselves driving our cars in. Thanks all for your time and I hope that anybody who has this issue will take the time to photograph, document and raise a complaint with both parties on this matter in the hope of some light at the end of the tunnel. 45bvtc, hopgop1, Stu+mel and 9 others like this. At £200 ish a tyre I can see why their "head office" is awesome! kkp0897, Thundercliffe81, Bristle Hound and 4 others like this. Good write-up Matt, good luck. Perhaps also write into What Car? Thundercliffe81, q5man and AudiNutta like this. It’s another complaint that can be registered, that’s what’s most important. But going forwards it would be ideal if they could have the tyres. This won’t cost any of us a penny this is the important thing, it’s just time but I appreciate time is valuable for us all. Thundercliffe81 and q5man like this. Nicely put across there Audi nutta, are both the PFL and fl camber/ suspension setups identical? If so I don’t recal the R01 tyres every having this problem or documented about before. A Hugh design flaw surely with this R02 predecessor tyre then. They must be slightly different, if I remember correctly when the FL was released I’m sure there were handling tweaks advertised? I don’t think the RO1’s ever had this issue either, will be interesting to see if anybody puts those on their FL and if it happens still. What confuses me is that @T-800 doesnt have the issue on his FL, that’s the only thing that leaves me doubting it’s the car. 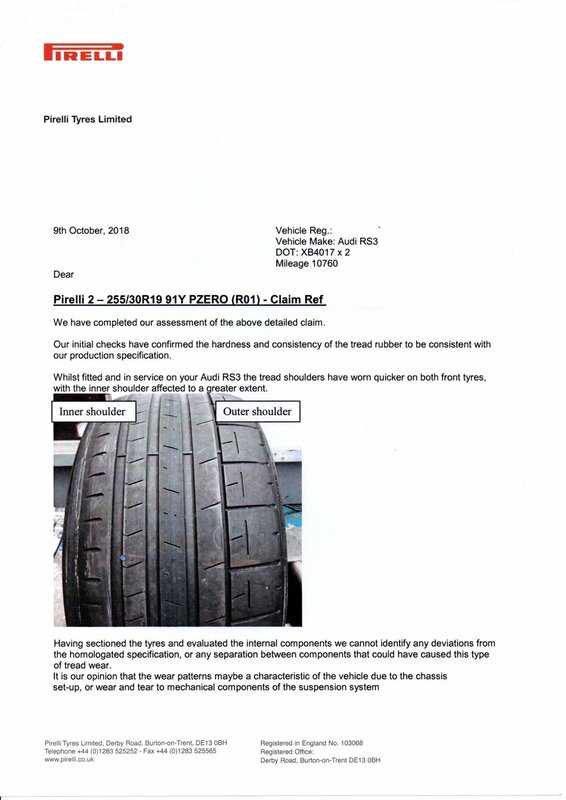 Given that I followed the same process as you and got the same letter back from Pirelli after them inspecting my tyres, I would definitely put this down to a design flaw on Audi's part. I think it's a good shout to contact What Car? and/or a similar publication - it's what the MK3 Focus RS owners did regarding their 'chocolate engines' and they promptly put up an article shaming Ford which no doubt gets the attention of marketing folk! It's free clicks for them, so I have no doubt they would do a write-up on this if we asked and provided them all the proof. 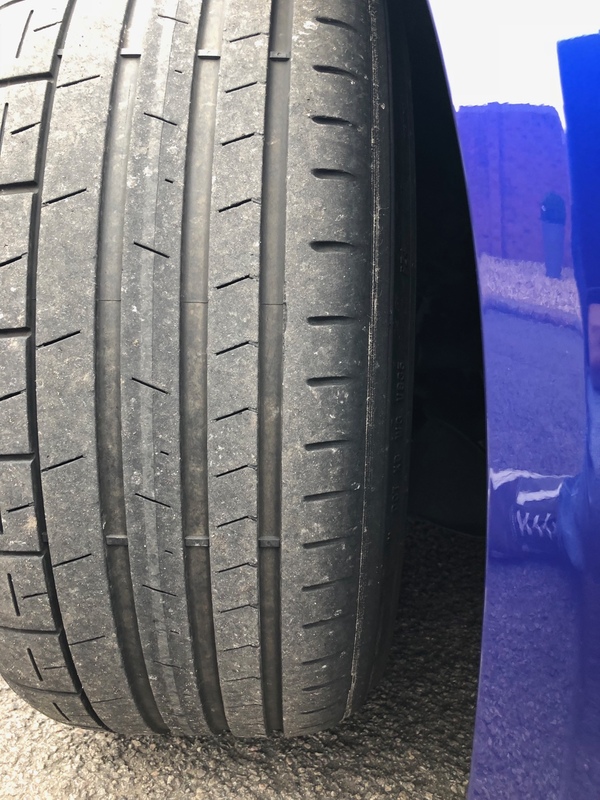 I too am confused, I had my front tyres changed (11,000 miles) and I inspected, alongside the Mechanic, the old worn Pirellis, Although the wear was slightly uneven, Mine was actually the outer shoulder being more worn down and this was later found to be due to alignment which I had done. 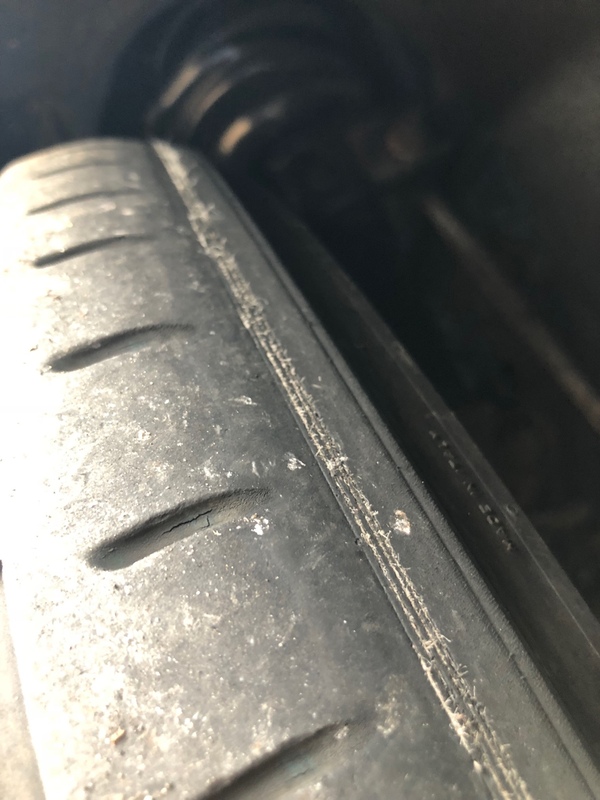 I didn't have anything like what you and others have pictured and ZERO excessive wear on the inside of the tyre, I am at a loss and really unsure if it is something affecting a small batch of these cars? I will contact What Car, I will try and get an email out tonight and will send all my evidence of wheel alignments etc and see what becomes of it. Maybe then from there we can each contact them? If What Car post an article warning people about a fault plagueing the RS3’s, I can only imagine this should prompt a reaction from Audi. Hmm that’s odd! Pirelli picked up on my outside edge being worn, on reflection it was but only slightly. Your alignment was out was it? I don’t see how a batch of them would be different to the next, mine and Callum’s cars were built 3-4 months apart. Yep do not have this issue Audinutta. My current set up is 8mm spacers all round. 7000miles now, even tread wear. Probably have another 3-4k miles left. Tyres, are and have been since i got the car, 2.3bar on the rears 2.5bar fronts (thats +/- 1bar). And I'm pretty OCD about ensuring the tyre pressures weekly. Oh and no major / minor knocks that might of shitfing the tracking / set up. Bad batch of tyres since sorted? Hmm, maybe the issue will become more obvious as the tyre wears further. The way it wears can fool you into thinking it’s rather normal, it doesn’t stand out. I’m 3000 miles into my next set and I’m pretty sure I can see the inside edge falling away already. I found it odd, but definitely nothing like you have experienced, pretty normal wear overall. Yeah it was out albeit marginally, probably from the crappy roads and pot holes! So I had that Sorted. Who knows, but something clearly isn't right, although I don't think it seems to be a widespread issue. Hopefully you reach a point where we have a definitive response though! good luck bud! It doesn’t look obvious when there is still tread but when they were off there was a definite step in the tyre it was odd, like a cliff edge drop when I got to the cords stage of the tyre. If you spend more time at motorway speeds I’m convinced the wear will be prolonged as the issue according to Pirelli is when you are turning from lock to lock. It is confusing how it isn’t affecting us all, but it didn’t rely isn’t an issue that only I’m dealing with. Could this be something on mag ride or non mag ride cars ? Or cars with spacers vs standard ? Standard suspension on mine with spacers. I’ve got Mag Ride and spacers. Standard suspension and no spacers for me. Have you had your mag ride recalibrated / checked since new? It’s been recalibrated by Vag Car Coding yes, back in the summer. I hadn’t even considered Mag Ride being a factor, still don’t know why it would be. q5man and sve170 like this. If it’s not the tyre, unless something is shifting whilst driving which would be noticeable, it will be the alignment that’s causing it IMO. The Oem Castor spec may not be right for the car, or it was incorrectly set. It’s got to be an alignment issue but all any of these tyre centres will do is set your car up to factory spec. I tried to suggest they do a custom setup, but that wasn’t up for consideration. Terrific right up, let’s hope the ball gets rolling within the forum members. I worry that regardless how many of us have this issue, Audi will as usual just ignore it. Are you ever up Huddersfield way?. There’s a legend in the town who has his own 4 wheel alignment business. All the local main dealers even use him. It’s where I take mine too and my previous heavily modified R32. He’s been doing it for ages and then set up on his own with the latest hunter machine. Not far from the M62 J23, 24 or 25. Is your castor closer to the negative spec or too positive? Is anyone experiencing this wear with any other brand apart from Pirelli? Only reason I ask is that on my Ghibli, the Pirellis were the OEM spec tyre for the car but they were horrific. On full lock they would be really grabby and noisey. When the fronts were changed the inner shoulders were excessively worn in comparison with the tread. I swapped then out for Conti's and all my problems cleared up. The tyres lasted longer, they were quieter and didnt wear the same. The "grabbiness" was gone as well. So although Pirelli are standing by their product and blaming the chassis, could it just be the combination of the two rather than one or the other? PS - Superb thread. Thanks for sharing. I just changed from Stock staggered Pirelli's to Michelins. My outside edges were totally bald. The insides were perfect, no issues at all. The shop reckoned my alignment was well out too, but I dont have any kind of printout to see. Wow. I'd kept an eye on this previously. You've gone to some real depth here and dig out blind. I salute you. I'm hearing the whole "It's just a design characteristic" rhetoric a lot these days from Audi. Not good enough. Wouldn’t it be worth removing the spacers for a trial period, that must be having an impact. AudiNutta and Thundercliffe81 like this. I can't for the life of me understand why you have carried out all this troubleshooting when there are aftermarket parts fitted? I would have thought both Audi and Pirelli insisting the car was at a completely stock setup? Having spacers fitted surely makes all the testing is null and void regardless of what the alignment reports suggest? Did Pirelli do all this free of charge? Has Audi had your car back and forth free of charge under warranty too? Were they both fully aware there were spacers fitted? Billy, you have no chance with aftermarket wheels, spacers and PS4's, I wouldn't even bother wasting my time if I had your setup. q5man, AudiNutta, teslaboy and 1 other person like this.